Reetsyburger's Refuge: Bikes Attack in Uptown!!!! 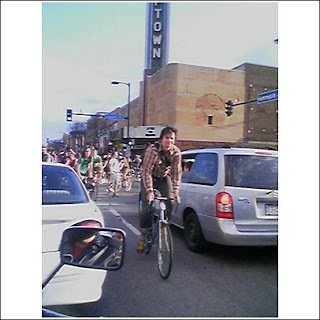 gerg and I were out for a motorcycle ride a couple weeks back and an intersection in uptown was attacked by renegade bicyclists. I snapped some photos on my phone from the back seat of the motorcycle. 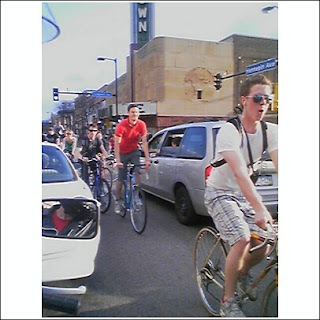 They first congregated in the center of the McPunk intersection at Hennepin and Lagoon. Then they spread out among the gasoline powered evil ones. gerg and I were pretty charmed by the shenanigans. One girl yelled at us as we sat on the motorcycle smiling, "Still not a REAL bike!!" I almost decked her, just on reflex because I was wearing a bike jacket and boots. Then I remembered that I thought their display was pretty cool, so I let her get away with it. 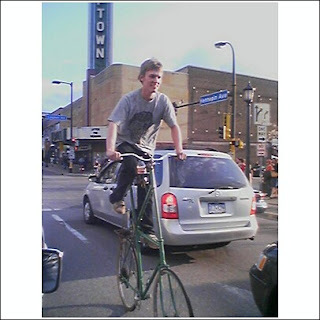 There was this one guy on a really tall bike. I thought that was pretty cool, and I thought it would be funny to shove a stick in his spokes just to see him fall, Tom & Jerry style. Not cuz I have anything against bicycle protesters....I think the cause is legitimate (even if some of them are just plain rude). I just think falling down is funny. s4xton - tell me about it! Any idea what their organization is? Mc Punk? Is that what Rock & Roll McDonalds has been re-nicknamed posthumously? I see, the punkers have been named. I love those tall bikes! Basically it was a bunch of tattooed, dredlocked, dog-owning, tall-bike-riders. 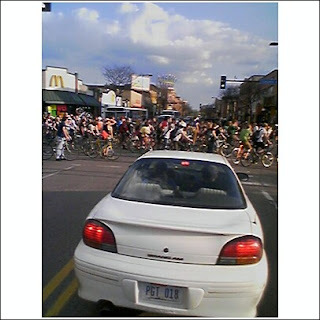 It seemed like some sort of commune, with people coming and going in cycles. They were the most interesting neighbors EVER. One girl had a star-type tattoo around her entire eye, and they painted their house hot pink. David - Now I have that Wesley Willis song stuck in my head. But seriously, what would the "McPunk" sammich consist of?